Has anyone given any thought as to whether or not we should stockpile charms and Battle & Training Stones in preparation for the new pets in the expansion? Thanks for your thoughts on the issue. => 1.700 charms for the pets / toy. and if you really need to, 5 charms => 25 bandages. - WoD rewards have been nerfed (-50% reward) and the garrison daily is now 1 per account instead of 1 per toon. You should have done it before the nerf. I have stockpile a lot of charms / stones before the 7.0 went live. Neolarva that screenshot is glorious! I got tired of doing the dailies so I only did the "easy" ones (Beakanator and the 3 birds) but still stocked up 3600 charms plus 2 bags of rarity and leveling stones. They'll definitely come in handy next xpac, I think. Gráinne also has a pretty hoard but that's even more! 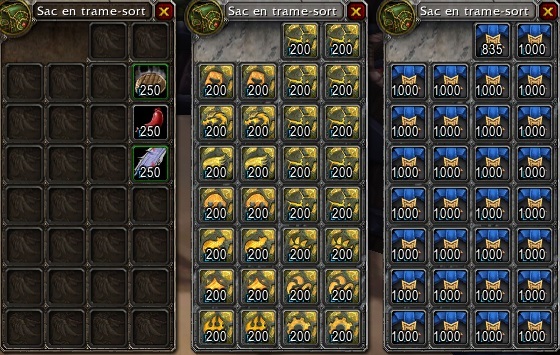 For comparison, there you have myself who using mostly one character (sometimes the second one because of experience, but never repeated the quests, I'm such lazy ) and picking up the battles conveniently as they were passed by*, I managed to gather ~1.8k charms, ~900 yellow stones, 30 blue stones and some duplicate pets for trade. * Done full TToT circle a day maybe four times, Ashlei maybe 75% of the time, Taralune and Tarr while farming stuff in Nagrand etc. You can get it. I have about ~7k charms set aside and a bunch of yellow upgrade stones...and I thought that was impressive. That screenshot is nuts. Ohhhh buggers the bonkers! I still have about 133 to bring up, so was not able to collect/save any rocks at all, but hopefully, my collection is good enough to be able to do fine during the expansion, although I am leaning towards not getting it and possibly leaving the game altogether. The Pet Battles has been the only thing carrying me for the last 6 months, and it was challenging to get the proper balance and ideas together to take down some pets and I liked that challenge, unlike the game itself, that became nothing but the same thing in the jungle. So far, I'm still OK with things, but struggling a bit (not really) to get the 15 Pet Charms daily, and not enjoying having to do Cymre, the only fight I have a bit of a hard time with, even though Anubiseth has helped a lot. But the 3 full health returns on the 3 toons, is a bit difficult and frustrating at times. I have been doing all the other 5 of those dailies and leaving that one out of the rotation. Just not a fun fight for me. AND you can not learn anything about using those abilities because we, the players, do not have them -- so it becomes a cheating situation for the home team. 133 or so blues to level to 25, and then 124 greens to level up to 25, most of which, at this time, are still under 5. I've concentrated the efforts on blues almost exclusively as you can see if you look at the pets list in the search. The dailies has been strictly about getting one blue rock to upgrade a pet that there is no blue to farm for. Uduwudu wrote: So far, I'm still OK with things, but struggling a bit (not really) to get the 15 Pet Charms daily, and not enjoying having to do Cymre, the only fight I have a bit of a hard time with, even though Anubiseth has helped a lot.